Eggs will be awarded for all entries and even more for winning entries! Winners will also receive a General Achievement medal. Since this is the Seventh, and 7 is a number with a mystical significance, I've upped the prize pool a little bit. All non-winning entries will receive 1 egg each, max of 5 entries. Entries MUST be 70x70 pixels to be entered into this contest. All inventory item images must be this size. No GIFs allowed and images must have a transparent background. You may send anywhere from 1-5 entries. i'd enter a few but, y'know, gambling... .
riskllama wrote: i'd enter a few but, y'know, gambling... . 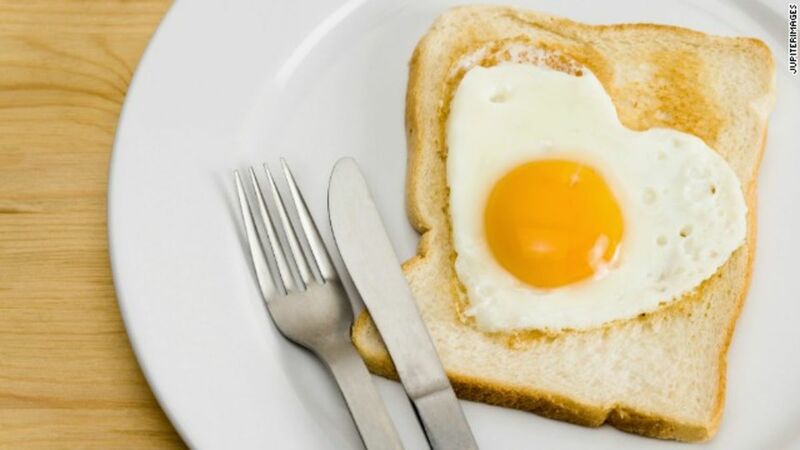 Isn't there a template we have to use, or can we just create any kind of egg we want within 70x70px? iAmCaffeine wrote: Isn't there a template we have to use, or can we just create any kind of egg we want within 70x70px? No template, anything will do. We've had some weird submissions in the past. Just remember that the background must be transparent. Check out the link. Last year I went through and compiled all of the images (except for a couple that have gotten lost) from the previous years. You can see the gradual evolution. I think the first two years the rules were different -- there was an egg outline the first year, and I think for the first two years you could submit them any size and we'd shrink them down. But that was long ago. The current rules date from I think 2016 are are essentially unchanged for the last three years. But it's fun walking down memory lane and you might find some inspiration. Sorry, no. The deadline is tight already. Easter event starts April 16th. After the April 9th submission deadline I need to post a vote in the Team forum, get the mods to vote with all their different schedules, compile their votes, and send the winners to bigWham so he can plug them into the system and they can start dropping on April 16th. I left myself only a week to do all that, and I'm working that week so my CC time will be limited. So, no, not a minute longer for you. You've been given slightly more than two weeks, I only have one. I'm in the contest. Hope everyone likes it. When is the Easter tournament going to start this year? StephenWillhite wrote: When is the Easter tournament going to start this year? HitRed wrote: I'm in the contest. Hope everyone likes it. I can't wait! The Easter map is one of my favorites. And I love the Easter scenarios. Honourable mention goes to first-time contestant HitRed, who's Periodic Egg very narrowly missed getting into fifth. This image is bigger to see the details. It is my sad duty to report that the 1st place finisher has been disqualified, as it seems his art was not his own design and mainly imported from commercial clipart. 2nd place gets bumped up to 1st, 3rd gets bumped up to 2nd, etc. 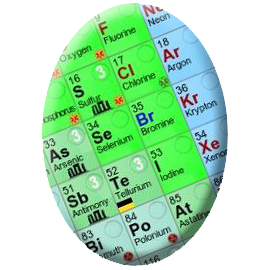 The von Eggsburg egg will be pressed into service as the 5th egg in the rotation. The event launches in the morning, a quick decision had to be made. The von Eggsburg egg was BW's favourite. I'd still like to see what the InnyaFace egg was like? dakky21 wrote: I'd still like to see what the InnyaFace egg was like? Nice and great job, everyone! 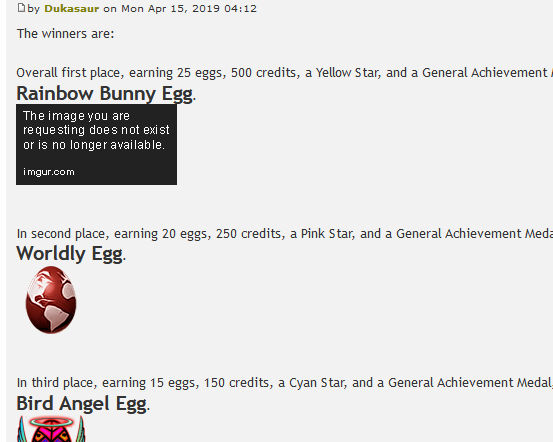 Dukasaur wrote: It is my sad duty to report that the 1st place finisher has been disqualified, as it seems his art was not his own design and mainly imported from commercial clipart.